Is time for you to start using your health as a vehicle to CRUSH YOUR GOALS & make $$$$, like the badass BOSS you are! You are an entrepreneur, a businesswoman, a boss lady (however you want to call it! 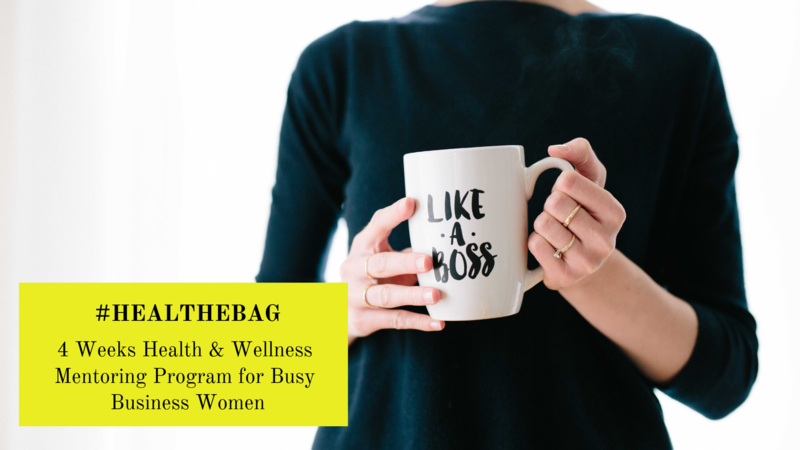 ), or perhaps you’re climbing the ladder on your 9-5… or maybe you’re a stay at home mom with a side hustle BUT you STILL haven’t figured out how to stay on top of your health, and use it to propel your business goals. Tired all the time, feeling sluggish, and unproductive. Brain fog (memory problems, lack of mental clarity, poor concentration). You are not sleeping properly (insomnia). You feel cranky, and have mood swings. Not able to perform at your highest level and CRUSH your goals. You are TIRED of watching other people be on top of their game, their health and getting all the opportunities that YOU could be also having. Your skin has seen better days (puffy eyes, and under eye bags included). You’ve gained weight the past months/years. You feel like 2018 took a toll on your health. I can relate, because I’ve been exactly where you are. The truth is… your health is the problem and it’s affecting your success. Most of us have no clue how good our bodies are meant to feel and perform. The wellness and nutritional choices we make affect our bodies and it could be the culprit behind your constant lack of achievement, low energy, migraines, foggy brain, and even cancer or diabetes risk. If you’re ready to make 2019 the year EVERYTHING CHANGED FOR THE BETTER, you’re going to need to make some changes – but don’t worry, it will be worth it! The life-changing solution for the busy go-getter businesswoman, entrepreneurs, independent professionals, and other women’s groups to improve her health [and her life] in 4 weeks. Learn the right habits & systems that will re-boot your health, streamline your wellness and have you functioning at your HIGHEST capacity? Wake up EVERY DAY full of energy, with the stamina to take on your day. Have the mental clarity and focus to avoid mistakes that can cost you $$$, embarrassing situations and guilt. Learn how your body function, so you can take FULL advantage of it to pursue your personal & business goals. Feel lighter and on top of your game… and yes, you will lose a few pounds too! Week 1: Let’s Get This Inflammation Party Started! In this module, the healing process begin! You’ll start by learning how healthy is your gut, which things to do to heal it and how it is affecting your life NOW! I’ll teach you what to eat, supplement I love, my fav wellness rituals and more. Everything focused on gut health, fighting your bloat (bye, bye 3 months pregnant belly!) and getting you alkaline (a.k.a. say adios to inflammation & chronic illnesses!). Week 2: Let’s reboot your BRAIN! In this module, we start healing your BRAIN! What you’ll learn here will change your brain and your life… Yes —you can make yourself smarter! You’ll learn practical, short exercises—4 minute Brain Hacks—to engage your mind and improve your memory, your ability to learn new skills, and function more efficiently. You’ll also learn my favorite supplements, and foods to boost brain function. Week 3: High Achievers Healthy Habits! What does 90% of the high achievers KILLING the game and making MILLIONS out there have in common? They don’t rely on their own motivation, they create HABITS! In this module, you’ll learn the most effective healthy habits for reaching long-term success, and vibrant well-being no matter your age, career, strengths, or personality. Adopt these habits, and you’ll win! Whether you want to get more done, lead others better, develop skill faster, or dramatically increase your sense of joy and confidence, this module is for YOU! Week 4: All about ENERGY, baby! Having the energy, and stamina needed to tackle your business goals is not an easy treat… In this module, you’ll learn how to create and Raise your energy so you have a bak full at your disposition! From my very best nutritional guidance, my same steps I take as a busy entrepreneur always on the go, what to do to boost your energy before a meeting and important events in your life, how to stay energetic while traveling and much more! You’ll also learn how to HANDLE the waves of energy’s ups & downs, keep the balance, stress-free and make it work for YOU! 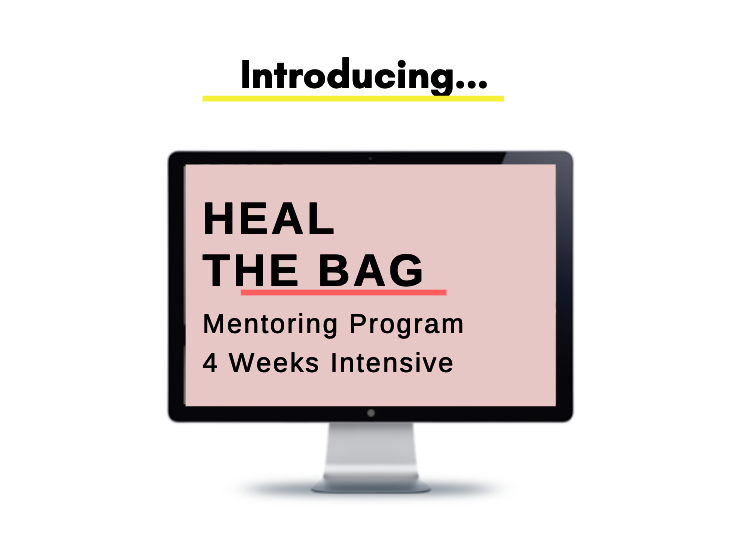 What else comes with the Heal The Bag 4 Weeks Mentoring Program? Lifetime access to the recordings of the 4 weeks live classes. All e-books provided in the mentoring program (PDF Downloadable worksheets, templates & trackers!). Access to the private #HealTheBag community EXCLUSIVE only for the mentoring members. Access to my private GLOW SQUAD Facebook community. 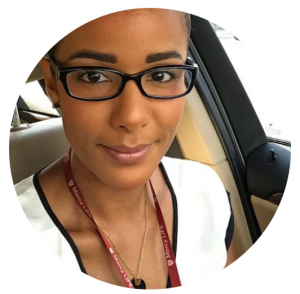 You are an entrepreneur, a businesswoman, a boss lady (however you want to call it! 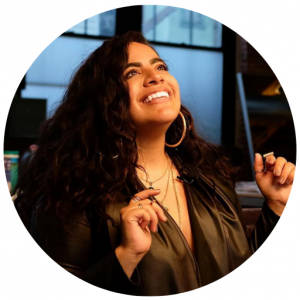 ), or perhaps you’re climbing the ladder on your 9-5… or maybe you’re a stay at home mom with a side hustle. You are tired of feeling tired, feeling sluggish, unfocused or unproductive. You want to be a high achiever, CRUSH your goals, and have the stamina and focus it takes to MAKE THOUSAND$$$! You want to break your negative patterns and are ready to rock this 2019! You’re looking for a quick fix formula to become a badass, high achiever businesswoman. What you’re really looking for is a meal plan and to lose weight. Not willing to make the necessary lifestyle changes, and get out of your comfort zone. Women hire me as their health & wellness coach when they’re ready to use their health as a vehicle to propel them further, reach & surpass their business goals. Here are a few of my clients who are now making more money, and seeing the big impact their health has had on it! ARE YOU READY TO GET HEALTHIER, START CRUSHING YOUR GOALS, & make $$$$ like the badass BOSS you are? ?